TS SBTET Diploma C14 1st Year & 3rd Sem Results Oct/Nov 2015 are released. 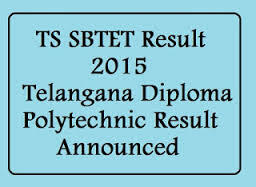 Check Telangana SBTET polytechnic c14 results 2015 here. Today TS SBTET has declared C14 results for 1st year and C14 results for 3rd sem students. TS SBTET Diploma C14 Results Oct/Nov 2015 Telangana SBTET has announced diploma C14 results Oct/Nov 2015 for 1st year, 3rd sem. Today TS SBTET released only Oct/Nov 2015 diploma results for C 14 and soon we can expect for all other curriculums such as C14, C09, C08, ER91 and CCC. C-14 RESULTS OF I YEAR,III SEMESTER OF TELANGANA STATE ARE RELEASED TS SBTET and AP SBTET conducted diploma polytechnic examination in October and November for all schemes C14, C09, C08, C05, ER91 and CCC. Usually diploma board will publish the result in January 2nd week. This time we are expecting the polytechnic results earlier. As a good signal for our hope, C05 results announced today by technical education board. Also Check : AP SBTET Diploma C14 Results Oct/Nov 2015 SBTET 1st year & 3rd Sem results Oct/Nov 2015-16 Diploma result will be available in android app also. To see the SBTET 1st year results and alerts download the SBTET android app from play store. This app provides the diploma alerts such as result date, time table, important notification and latest news updates for polytechnic students. Last time sbtet results announced by semester wise. So this time also we can expect first year result one day, 2nd and 3rd year results another day. SBTET results in Student portal internal marks SBTET results 2016 will be available in SBTET student portal. Check the student status and internal marks from below link.